Hopeful candidates flocked to designated registration centres across the kingdom on Monday, day one of the registration period for the March 24 general election. The Ministry of Finance has extended registration in its 5% VAT refund program until February 15, hoping to boost spending during the Chinese New Year. Thai E-Commerce Shoots Up To 3.2 Trillion Baht In 2018. The Palang Pracharath Party (PPRP) has vowed to push for a controversial land policy proposal that would allow farmers holding Sor Por Kor documents to seek commercial gains from their properties if it forms government after the March 24 election. SET-listed Thai Union Group Plc (TU), the country’s global seafood conglomerate, has partnered with two establishments to set up “SPACE-F”, aimed at building an ecosystem for food tech startups and supporting the company’s business expansion into the non-seafood segment. PRIME MINISTER Prayut Chan-o-Cha yesterday launched Asean Cultural Year 2019 at Government House, as Thailand takes its turn chairing the 10-member regional grouping. Growth in Thailand’s manufacturing sector slowed slightly in January as stagnating demand weighed on the industry, according to a survey. Myanmar authorities asked to help find fugitives in major cases have detained 81 Thai nationals near the border with Chiang Rai province on charges of illegal entry. The Department of Intellectual Property has rejected all requests for cannabis-related patents. Activist Jatupat “ Pai Dao Din” Boonpattararaksa may be released from prison soon after a military court dropped two illegal assembly cases against him and six other activists. 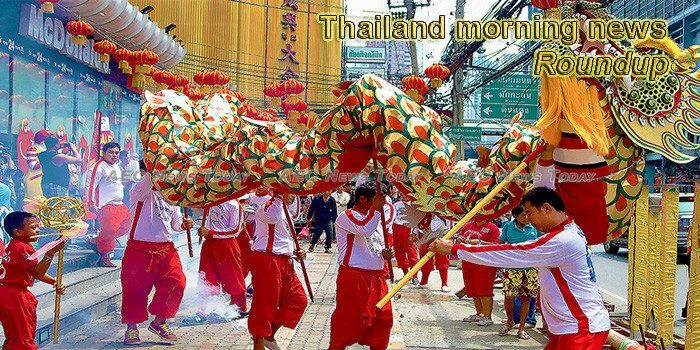 About 400 people would be travelling to Thailand to retrace their cultural roots and also promote trade and tourism, at a first of its kind event in Bangkok on February 9 and 10. The future of peace in Southern Thailand now depends on the discretion of both panels representing the Thai government and separatist groups, said Malaysian facilitator to the peace talks Abdul Rahim Noor. Is the durian boom harming Thai agriculture? China’s burgeoning middle class has taken a liking to the Durian, and are now being supplied via a rapidly evolving transportation infrastructure within the Mekong region that delivers it to Chinese markets to sell for up to US$60 a piece. he telecom regulator plans to use the Broadcasting and Telecommunications Research and Development Fund (BTRDF) to provide low-interest loans to mobile operators as an alternative source of funding to expedite 5G-related investment. The Miss World Organisation (MWO) has today confirmed that the 69 th Miss World Final will be hosted in Thailand. BANGKOK — Excitement spread Monday as dozens of candidates flocked to register their candidacies to contest the first successful election since 2011. Among the hill-tribes of northern Thailand’s Chiang Rai province, children typically grow up without having Thai citizenship, resulting in unnecessary complications that dog them into adulthood. esidents throughout Phuket Town are being asked to pay extra attention to fire safety concerns amid the upcoming Chinese New Year celebrations, which will get underway tomorrow (Feb 5). That last, sad sanctuary for smokers in transit — the glass menagerie known as the smoking lounge — is officially gone from Thailand’s most important international airports. Mara Patani, an umbrella organisation of insurgent groups in the deep South, has announced its decision to suspend peace talks with the Thai government and called for the replacement of the Thai delegation head General Udomchai Thammasarorat with someone more credible. New laws concerning water distribution and water usage will be enforced in the next two years following the newly endorsed water-resources bill.